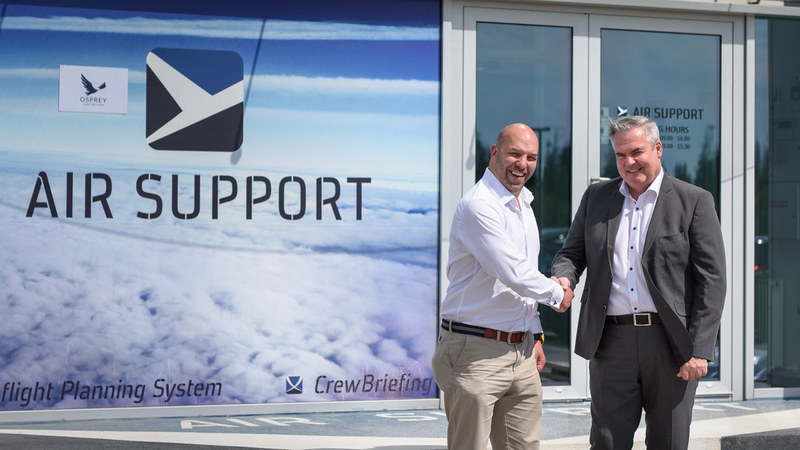 Left, Andrew Nicholson, CEO, Osprey Flight Solutions and Peter Gravesen, CCO of AIR SUPPORT. Air Support, a provider of flight-planning software to private and commercial business aircraft operators, has announced a partnership at EBACE with the risk management-system Osprey Flight Solutions to offer customers a unique function of its PPS Flight Planning System. Under the new agreement, Osprey’s risk management service, launched last fall, will integrate with Billund, Denmark-based Air Support’s PPS system, to deliver instantaneous visual and written risk assessments directly to the operator, supporting operational decision making, quality control, and compliance. Osprey’s leadership believes the enhanced system will improve the quality and consistency of human analysis to offer a new over-flight security and risk assessment solution while at the same time, keeping costs down. UK-based Osprey's analysis team also publishes email alerts on emerging threats to the aviation security environment, or where an incident reinforces its advice and recommendations for an overflight risk area, airport or country.